Ward boundary changes: citizen input requested. The late Rob Ford always chafed at the number of councillors at City Hall and thought it was an unmanageable (and expensive) number. He thought that Toronto should have the same number of councillors as federal ridings; i.e. one councillor per riding instead of the current two. From what I gather, the current number of councillors (44) may actually be increasing slightly as a result of population increases and needed boundary changes. By way of context, between the baseline year of 2011 and 2030, Toronto’s population is predicted to rise by 500,000 and the extra people won’t be evenly distributed. 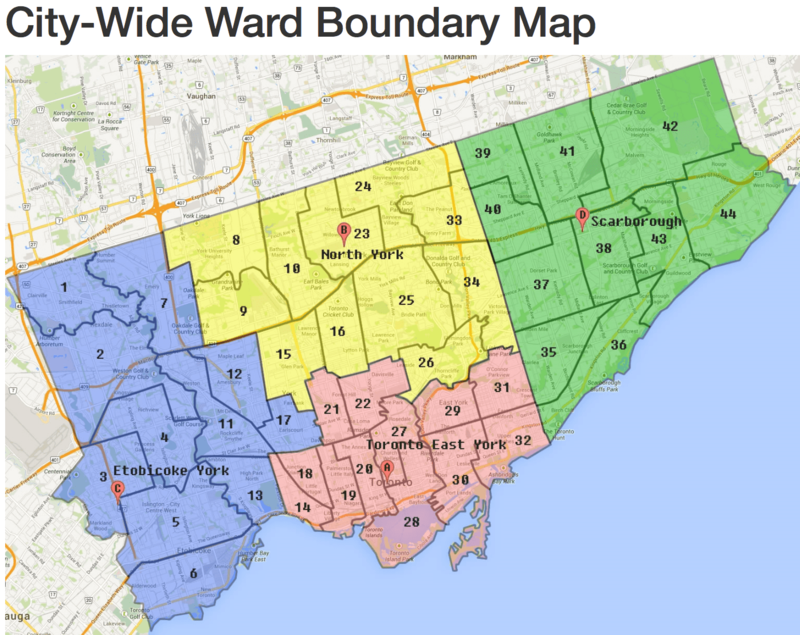 The subject of ward boundary changes is a complex one. Dedicated citizens may take some time to absorb this document giving the background to proposed changes and asking for input. Quite simply, as wards’ populations change, the numbers of people represented by one councillor are increasingly out of whack. For example, the number of people living in the downtown core is increasing rapidly as more condos are built there. It’s beyond most citizens’ abilities (mine anyway) to absorb all the variables as there are so many factors to juggle. Nevertheless, citizen input is being requested and then the boundary review folks will make their recommendations to council for a vote.